Students in the U-M Graham Sustainability Institute’s Environment 391: Sustainability and the Campus (ENV 391). 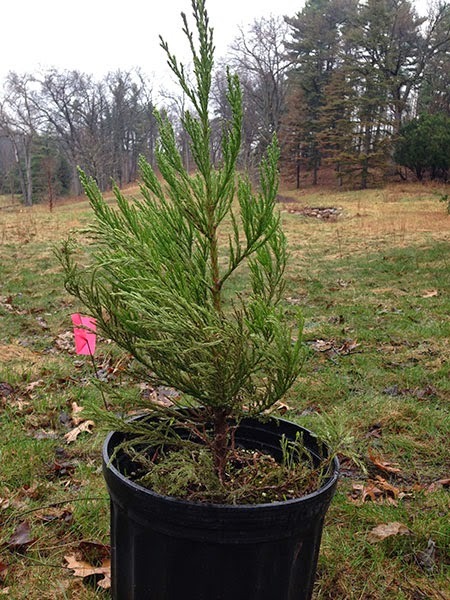 planted a dozen sequoia trees in Nichols Arboretum on April 25. The planting was the culmination of a group project aimed at taking carbon out of the atmosphere by planting old-growth trees. We spoke with Isa Gaillard about the project. Gaillard, who heads the class group, is a Graham Undergraduate Sustainability Scholar and co-chair of the Native American Student Association. ENV 391 is taught by Michael Shriberg, the Graham Institute’s Education Director, and uses the U-M campus as a “living-learning laboratory” to actively explore ecological, social, and economic dimensions of sustainability. Matthaei Botanical Gardens & Nichols Arboretum: Give us some background on the project. Isa Gaillard: Several classmates and I created a project called “Planting Old Growth Sequoia Trees to Sequester Carbon.” The project sought to formulate a comprehensive argument as to why the University of Michigan should get behind it and make space available for the trees. The carbon sequestration aspect of our project is one of the strongest points that we can use to do this, along with the potential for community action and ecological development on or near campus. Professor Shriberg offered planning and visionary support, our project sponsor Nathan Ayers of Chiwara Permaculture provided permaculture training, and the Archangel Ancient Tree Archive donated the old-growth champion sequoia trees. 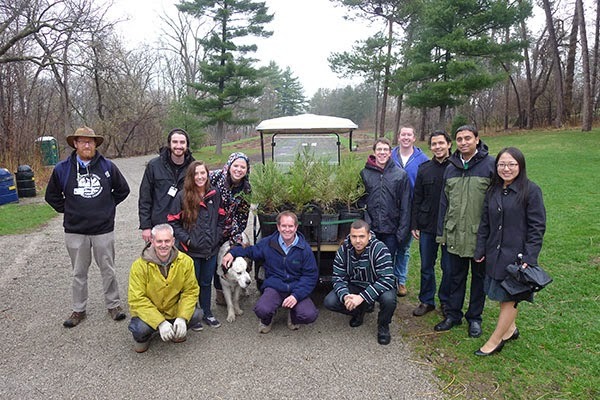 Students and Matthaei-Nichols staff pose in front of the sequoia trees at the Washington Hts. entrance to the Arb last Friday, April 25. Matthaei-Nichols: What inspired you to pursue this particular project? Gaillard: As the co-chair of the Native American Student Association I saw this as an opportunity to increase awareness of the long and rich history of trees in the state of Michigan. As a student planning to study environmental policy and someone with a deep interest in indigenous wisdom, I felt inspired to go beyond the concept of living sustainably, to living cooperatively—thriving by connecting nature with community and permaculture with the campus. Matthaei-Nichols: Why did you choose the sequoia tree? Gaillard: While there were some initial concerns about whether this tree could successfully grow in this region and climate, our project is the first of its kind, so what we are doing is groundbreaking in the sense that there is no guarantee of how these trees will do. However, permaculture in practice and as taught to us by our sponsor Nathan Ayers is built on biodiversity. So, while the sequoias may not be native to Michigan, we can optimize the surrounding ecosystem’s success if we plant the trees using permaculture principles and a long-term vision for the trees’ success. Matthaei-Nichols: The Archangel Ancient Tree Archive’s mission is to propagate the world's most important old-growth trees before they are gone. How did this initially influence your decision to accept trees from this organization? Gaillard: Archangel co-founder David Milarch came and spoke with the U-M Permaculture Design team. During his visit he donated a “champion” sequoia tree clone and said that he would supply the university with as many trees as needed. An individual sequoia ready to be planted. Matthaei-Nichols: How did you present your case for the project to the University of Michigan? Gaillard: In order to achieve the University’s Planet Blue Initiative goal of reducing carbon emissions 25% by 2025, the University will have to mitigate its carbon emissions by 200,080 metric tons of carbon dioxide per year. Many different strategies are needed to make this goal a reality, but planting old-growth sequoias in a permaculture food forest is one long-term strategy that incorporates a lot of potential benefits. These trees are one of the best at sequestering carbon, and they take out an increasing amount throughout their lifespan. When fully mature they sequester carbon at a rate more than 30 times that of other old-growth trees. Additionally, the trees can provide shade for a vast number of other plants including apple trees, blackberry shrubs, alfalfa, and clover. The possibilities for ecosystem services within a permaculture forest are limitless: from food, shade, and shelter for animals to soil retention, fertilization, and more. Other groups on the U-M campus are working to create these “food forests”— the Campus Farm, the Native American Student Association, and the Student Animals and Society Institute. So our project is part of a larger collaborative effort with educational, communal, and diversity components tied together to help bring the University closer to many of its different goals, all while enhancing the beauty and sustainability of our campus and the broader community. Matthaei-Nichols: What implications does your project have for what we can learn, what the University will gain, and what the project will realize? Gaillard: This project has far-reaching implications in the sphere of sustainability and, more specifically, for carbon sequestration and the mitigation of greenhouse gases. Our vision for a permaculture forest using sequoias as the canopy tree species is the first of its kind and will set a precedent for other academic institutions seeking options to decrease their own carbon footprint. There is little extant research on the carbon sequestration capabilities of a forest like the one we have designed. Consequently, this project can serve as an example and inform future research of its kind. Matthaei-Nichols: How many trees did you plant? Gaillard: We planted 12 trees. Each is about one and half feet high and about a year old. Environment 391 is an interactive, interdisciplinary course that draws on theory and practice in sustainability, environmental management, organizational change, and social advocacy. In this class students conduct a substantial, hands-on group project in conjunction with a university sponsor. Through site visits, guest lectures, discussions, lectures and the group projects, the course addresses real-life challenges of campus sustainability. Students complete the course with an understanding of the campus as a lever for social/environmental change and with the personal tools to act as change agents. Previous projects have created or helped launch major initiatives at the University of Michigan, including: the Campus Farm at Matthaei Botanical Gardens, the Ann Arbor bike share program, the “Go Blue Box” reusable container takeout program, the “How to be a Green Wolverine” guide, greening of commencement and Camp Michigania, and more. Michael Shriberg is the Education Center Director at the University of Michigan Graham Sustainability Institute. Nathan Ayers is the director of Chiwara Permaculture, a Michigan-based research, education, design and incubation firm that focuses on permaculture solutions. The Archangel Ancient Tree Archive propagates the world’s old growth trees before they are gone; archives the genetics of ancient trees in living libraries around the world for the future; and reforests the earth with the offspring of these trees to provide beneficial ecosystem services.